The DIV-Net: Delaying Gratification? What's Gratifying To You? My strategy is simple. I live on less than most - saving over 50% of my net income, year in and year out. This year I'm on pace to save over 60% of my net income. I use the savings from intense budgeting to invest in high quality companies that pay rising dividends. I'll then one day live off the dividend income my portfolio provides. This is all part of my plan to retire by my 40th birthday. Some people seem to think the delayed gratification of living on so little now isn't worth it because tomorrow isn't promised. They say you should live like today's your last day because it's all about YOLO, yo. Well, what is delayed gratification? Per Wikipedia, delayed gratification is the ability to resist the temptation for an immediate reward and wait for a later reward. Generally, the later reward is larger than the immediate reward would have been. That's the benefit of delaying gratification. You get less now for more later. But I'm not quite so sure I'm delaying gratification by living on little, and I'm actually going to make the argument that I'm doing the opposite. I would call what I'm doing hastening gratification. I know what's gratifying to me. Time. Time is everything, because without it we're nothing. Therefore, the ultimate gratification for myself is to have as much of it as possible. And that's precisely why I'm on the path to reach financial independence at such an early age. I can think of nothing more gratifying than having all my time to myself. Need six months off to travel? Being financially independent means you don't have to ask your boss for six months off. You do whatever you want. What could possibly be more gratifying than that; doing whatever you want whenever you want? Living on relatively little is easy for me because I don't find a great deal of gratification in spending my money on things that I know won't bring lasting joy. Who wants to own a bunch of stuff when I could one day own all my time? What possibly could you want to own more in life than your own time? I'm not really delaying gratification by budgeting, saving and investing. Every single day is gratification because I know all of these steps are bringing me one step closer to what's truly gratifying and rewarding: complete and utter freedom! The totality of the rest of my life all to myself, free to spend how I please. If you enjoy spending money on 6-8 restaurant visits per month, 2-3 cars in the driveway, a large home, cable TVsubscription, 2-week international travel jaunts, and a closet full of designer clothing, then living like I do would probably be quite a struggle for you. And if you truly find great joy from this lifestyle then perhaps delaying gratification today for even more of this lifestyle in the future might not be worth it for you. But I do beg of you to take a look deep inside yourself and make sure you're happy. If you're happy making lots of money and spending most of it, then I say more power to you. Living on less to have more time isn't for everyone, and neither should it be. However, for the rest of us there is only so much consumption that can possibly be fulfilling. This concept, from one of my favorite books, Your Money or Your Life, is The Fulfillment Curve. 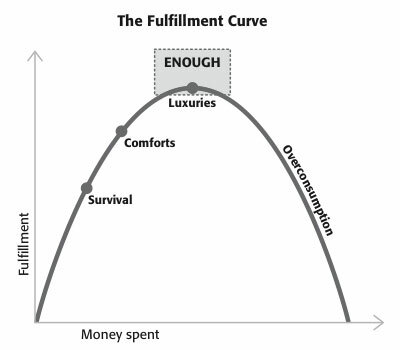 It basically tries to graphically demonstrate that there is a level of spending and consumption that leads to optimal fulfillment. This concept is a derivative of marginal utility. Too much of anything is a bad thing, and moderation in life is important. Living in your car is probably going to be very cheap, but also lead to a very unfulfilled, and potentially dangerously depressing life. On the other hand living in a castle that you can't afford even with three jobs is only going to lead to a very stressful and unhappy life, and probably land you back to living in your car. You could probably argue I live somewhere between "Survival" and "Comforts" currently. But the greater I allow myself to scale off to the right the longer I'll have to truly delay the one thing that I find gratifying: freedom. And that's exactly it. By living like I do I'm not delaying gratification, because I find gratification in freedom. By not having my freedom right now, everything I do is delaying the day when I'll own my own time and have my life all to myself. By living on less and forgoing many things that don't really bring me happiness I'm hastening gratification.